If you’re planning to visit the beautiful Island of Oahu, you’re in for an unforgettable experience! However, as with any other trip, the key to having a great time is to plan ahead. This is especially true when it comes to how you’ll get there and how to get around once you’ve arrived. For your convenience, here are 4 Oahu travel tips to know as you’re planning your vacation. Flights can easily be one of the most expensive parts of your trip. They also tend to cost more the closer you book them to your departure date. So, it’s a smart idea to reserve them as far in advance as you can to save yourself some money. Don’t just book the first flight you find though. There are tons of great websites that compare flight prices from different airlines for you so that you can get the best deal. One of the best Oahu travel tips we have for you is to consider getting a rental car while you’re visiting. This is simply because it gives you a lot more freedom and flexibility with your plans. While public transportation like taxis and the local bus system are available, it’s usually much easier to get to where you want to go with a rental. This is also an ideal choice if you have a lot of things on your itinerary or want to do activities that are kind of far away from each other. If you’re not from Oahu or any of the surrounding areas, the time difference might throw you off a little bit. To avoid feeling jet lagged, you can start adjusting your sleep schedule to your destination’s time several days before your trip. When you arrive, it’s also a good idea to get outside in the sunshine to reset your internal clock. You should change the time on your actual clock as well so that you can enjoy every second of your getaway and get to attractions at the proper time. The Island of Oahu is packed with all kinds of fun things to do! You’ll want to learn about all this action-packed island has to offer ahead of time so that you can make the most of your experience. If you have an adventurous group and are looking for something new and exciting to try, stop by CLIMB Works for our zipline tour! 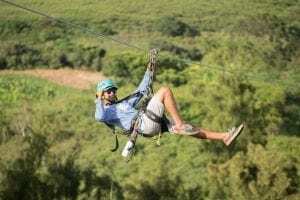 If you’ve never been ziplining before, don’t worry! It’s easy and our trained staff will be with you the whole time. You can glide side by side with friends and family as you take in the panoramic views of the beach, mountains, and picturesque farms. We want you to have the vacation of a lifetime, and you’re one step closer to that when you follow these 4 simple Oahu travel tips. Start planning your getaway today by booking our zipline tour, and get ready for an experience you’ll never forget!